A Rosé from 20 plots, all Premier or Grands Crus. This Champagne is a blend of 20 Premiers Crus and Grands Crus located on the prestigious Montagne de Reims and Côte des Blancs. It also is a blend of a single year, from the grape varieties Pinot Noir for 50%, Chardonnay for 35% and 15% of Pinot Noir vinified in red wine and aged for more than 6.5 years in the winery’s deep cellars, more than 33 meters underground. The colour is a sustained pink, with the intense colour of red pepper. To the palate, first impression of freshness with notes of red berries like wild strawberry with a finish on vanilla. To the nose : deep notes of citrus like lime or Menton lemon, with a smooth touch of Florida grapefruit. Perfect with a grilled or baked salmon, or with traditional Japanese sushi but also Chinese roasted duck. Served with sabaillons or red fruit cakes like strawberry cake, it will be able to disclose even more its aromas of wild strawberries or red berries like Montmorency Cherry or black cherry from Basque country. 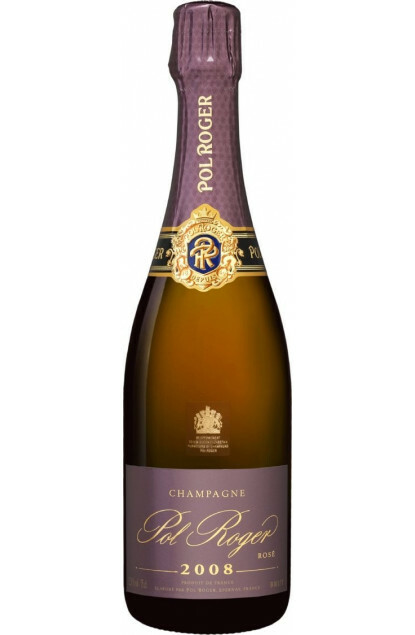 The first Pol Roger Champagne trade took place in January of 1848. This prestigious Champagne House was located in Aÿ until 1851, when it settled in Epernay, still under Pol Roger’s management. One of the few independent Houses, nowadays managed by a fifth Pol-Roger generation.